Over the years the number of kendo seminars, taikai and grading examinations has continued to grow. In February alone there will be 10 events in the European zone. In comparison to the few opportunities that were available back in the days when I started kendo this is an enviable situation. The challenge however is selecting which to attend. Some decisions are simple. If you are planning to take a grading examination the nearest venue provided by your local federation is the easy option. The same thing goes for your own regional championships. If however you are a keen shiai player in search of international experience, you could have a choice of two or three major taikai within weeks of each other. For those of us who are asked to referee and sit on grading panels, we occasionally receive invitations for several things on the same day and face the dilemma of which to attend. In this case I usually go with the first invitation. There are several weekends when equally important sensei will be teaching at the same time. In addition to the seminars arranged by national federations there are also a number of club events where the teachers have been invited direct by friends or former students. 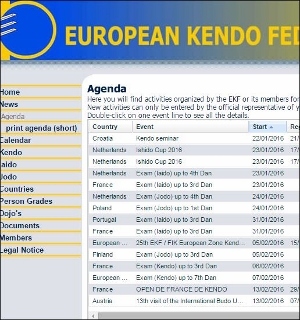 Some of these have been advertised ahead of time and some of these are still not on federation websites nor have they been flagged up to the EKF. I know of at least two hachidan visits to the UK that have not yet been formally anounced. Thanks to cheap air fares and the internationalisation of kendo we are now spoilt for choice. My only reservation is that when famous kendo teachers visit a country we should make sure that a significant number of people are there to benefit from their teaching. I have often heard Japanese kendo friends express surprise that there is no queue for keiko with visiting hanshi, whereas local kendo students in Japan seldom have a chance to practise with them. I have queued for most of the hour allocated for asa-geiko at the Kyoto Taikai for one practice with a teacher for whom I have never waited for more than 5 minutes in the UK. In some ways we enjoy an enviable situation as international kendo students, but we should be careful not to take our luck for granted. In an ideal world we would stagger sensei visits, so that they are distributed evenly over the year. Unfortunately this is almost impossible to arrange as visits abroad typically happen in gaps in the kendo and academic calendar in Japan. My suggestion is that we make the most of as many visits as we can when we have the opportunity. Hachidan are not like buses; you can never guarantee that there will be another one along in a minute. After starting last week’s slightly heated debate about the value of learning kata from Japanese sensei. I should make it clear that I have always valued the instruction and guidance of senior teachers and I try to both reflect this in my own keiko and the advice that I give others. Kendo has a clear hierarchy and those of us who are, or have been privileged to learn from those at the top are fortunate. 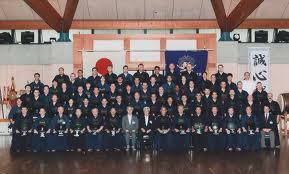 Whilst there are a number of 9th dan sensei still with us, Hanshi 8th dan is now the pinnacle of kendo achievement. Kyoshi 8th Dan follows and then Kyoshi 7th dan and Renshi 7th dan and 6th dan. There are a handful of 8th dans outside of Japan and Korea, but by and large kenshi from other countries are lucky to be taught by a 7th or 6th dan. What is not taken into account is that thanks to the ZNKR and the individual efforts of many senior sensei, the kendo world is now a very small place. Many of the eminent hanshi now travel the globe on a regular basis, leading seminars, helping with taikai and generally spreading their knowledge to the international kendo community. Often during these trips they are available for keiko to all comers, which is a very different scenario to their accessibility at home. Japanese friends who have attended seminars in Europe have been astounded that a British shodan may only have to wait for minutes to practice with a famous hanshi, when a Japanese 7th dan could spend an hour in line at the Budokan godogeiko or the Kyoto Taikai asageiko without reaching the head of the queue before yame is called. Of course these teachers are as active and as generous in their home country, but they have a limited amount of time, so often it is only close students who benefit from regular one- on-one training. More often than not it is a case of transmission down the grades. I have personally been very lucky in benefiting from the help of many important kendo teachers over the years both overseas and in Japan. In my younger days in Japan however, nothing came easily. It was a matter of putting in the time and effort and proving that you were worth a few minutes of sensei’s time before your existence was acknowledged. I am looking forward to my next year’s first practice on January 2nd. If I take a bit of extra time in mokuso it is because I will be thinking of all the teachers, past and present who have given so much to make kendo such a treasured experience. Happy New Year! Rainen mo yoroshiku onegaishimasu. 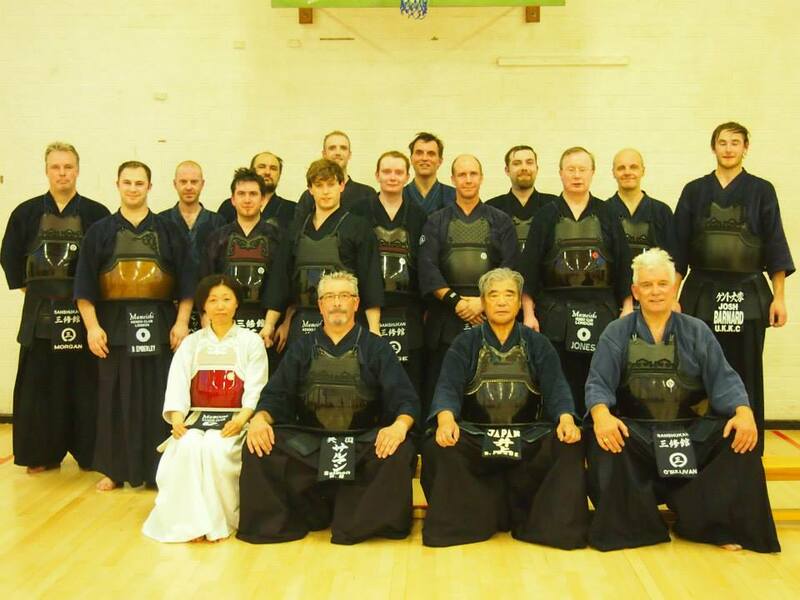 Inoue Shigeaki hanshi is currently visiting the UK and I have been fortunate enough to attend all of his keiko sessions and the weekend seminar. I have known Inoue sensei for some time and share some common ground in that I spent a comparatively brief period of time studying with Matsumoto Toshio sensei who was Inoue sensei’s teacher. After training, Inoue sensei showed me an essay that he had written in English on the purpose of kendo and he explained that although he has been hachidan for over 20 years, he is only now reaching the point where he feels at ease putting his own thoughts forward rather than quoting the advice of his teachers. I will ask his permission to reproduce his essay in this blog sometime in the future, but the key point of his argument is that there is a current trend towards teaching kendo with an emphasis on how to win in shiai without taking into consideration the broader aspects of personal development based on the “Principles of the Sword”. In his view the traditional pattern of finishing a hard day’s work, stopping at the dojo for an hour’s hard keiko and emerging feeling better and more determined to take on the next day’s challenges is losing ground to a more “train to win” approach. With this in mind he had reiterated the values of kendo that he has come to understand from his many years of shugyo. 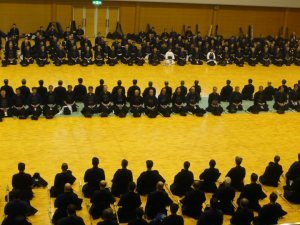 In 2011 I posted a translation of an article by Matsumoto sensei on the “Aim of Kendo”, wherein he emphasised the positive values of kendo in a similar way. Interestingly the article was written over 35 years ago. In this post I had also included a photograph of Matsumoto sensei. I showed this to Inoue sensei who took off his dou to show me the writing inside. He was in fact wearing the same dou that Matsumoto sensei was wearing in the photograph. Obviously not only the dou had been passed down along with much of his physical kendo technique, but the philosophy of kendo and its impact on how we shape our lives was an equal part of the inheritance. Of course we are all familiar with the concept of respect for those who taught us and those that taught them, but to see such a concrete example is a strong reminder that we never actually take possession of the values of kendo, we just keep them to pass on to the next generation. I briefly mentioned in my last post that a friend who recently returned to Japan was surprised at having to wait for 45 minutes of a one hour practice for keiko with a hachidan sensei in the Osaka Shudokan. George who witnessed and commented on the scene, will I am sure, back me up when I say this is not an unusual situation. At the shudokan, or any of the big civic dojo in Japan, you have to be quick and determined to practise with any of the senior sensei. The rule of thumb when I was regularly training there, was that you could have 2 keiko with hachidan , 4 with nanadan, or up to 8 at peer level in the allotted hour. Getting face time with senior sensei is an acquired skill. You need to put your men on faster than any of your rivals and be prepared to run to position whilst pulling your kote on. Some kendoka train themselves to tie their men in record time, others develop ingenious ways to pre-tie their men so that it can be slipped on instantly. These skills are equally useful for the monthly godokeiko sessions at the Nippon Budokan or asa-geiko at the Kyoto Taikai. Even though there may be 200+ hachidan in attendance, the chance of getting to your favourite hanshi is close to nil. On one occasion in Kyoto I made it my goal to be first in line with Sumi sensei. I got up at 4.30 a.m. , arrived almost an hour before practice started and placed myself approximately in front of the spot where he would be sitting. Fortunately for him, not so for me, he had been awarded hanshi the previous day, so whilst he initially sat facing the spot where I was waiting; he was pushed up the line by the longer time served, but still kyoshi sensei. I had to run an extra 20 metres to beat the queue and finished 5th in line. Nevertheless I got my keiko. Keiko with senior teachers offers two opportunities, one to practise with them and benefit from their advice; plus the chance to watch them with other students whilst you wait. The watching or mitorigeiko part becomes more interesting if sensei’s opponents are other kodansha. The downside is that usually they have the right to queue jump. This is a sensible arrangement as it allows them to get back to acting as motodachi with a minimum of delay. If however you are last in line and there is five minutes of keiko time left and someone steps in front of you, you may not see it that way. Returning to the challenges of making the most of your time in the dojo, the Japanese system for adult kendoka is essentially, well, adult. You can invest your time in waiting to train with the top teachers, or if you think it is needed, you can stay at the shimoseki end of the dojo and practice kihon geiko with a buddy of your own grade. As long as you take your keiko seriously no-one will mind. We have had an influx of hanshi; with Sueno sensei visiting us two weeks ago and Sumi sensei here on a stopover last week. Everyone was keen to treat them with the respect that they are due and to demonstrate the level of reigi that high ranking teachers would expect in Japan. I received a number of questions on the subject and a request to put some thoughts into a blog piece explaining the correct approach to etiquette in this and other situations. Just to clarify the terminology, reigi is the concept of etiquette and reiho is its physical manifestation. Some aspects of reiho are technical and unique to kendo or Japan. The angles to which you bow to your teachers and kamiza and to your opponent are prescribed and have to be learned. There are rules to govern the location of joseki or kamiza in a dojo and the correct places for students and teachers to sit. The gorei commands at the beginning and end of each practice are with one or two variations a set standard that we invariably follow. However if you think about it logically, the demonstration of etiquette in kendo is based on common sense and common courtesy that would be second nature in most cultures. It is however probably fair to say that some people are better at it than others. Those with ethnic roots in Eastern Europe or the Middle East tend to grasp the concept of respect for teachers and elders more easily than do their peers from Western Europe, but everyone would probably agree with the logic of many of kendo’s standard rules. In the dojo we do not chat amongst ourselves, so that we can hear the instructor. We ask permission before taking off our men and leaving the dojo, so that someone is aware in case of medical emergencies. We do not step over people’s shinai, as a shinai represents the sword and the sword is “The soul of the samurai”. We do not lean against the wall or slump, as the dojo is a place of physical and spiritual training and we need to maintain a spirit of readiness and awareness. Translating this common sense approach to the way we treat senior visitors, we should aim to give our best in keiko. When we cross the dojo to thank sensei, we should do so immediately after rei. Remember start with the most senior teacher and work your way down the line. Don’t ask questions. If sensei has some advice for you, he will give it automatically. It is accepted practice to take care of senior visitor’s bogu and deliver it packed with his folded hakama and keikogi to the exit. Decide beforehand who is going to do this. If sensei would prefer to take care of his own equipment, then allow him to do so. Of course this may be politeness on his part, so insist once or twice before you give in. In this case don’t be surprised if other junior teachers also refuse your kind offer of help. Whilst I am usually grateful for this sort of attention, I would not dream of taking advantage of it if my senior teacher has said no. To do so would be discourteous. So although many aspects of kendo etiquette can be learned from text books or by asking your instructor, it is difficult to go wrong if you follow the basic rules of human courtesy.